The Exeter Village Board met on Tuesday, November 8 at the new community classroom at Exeter-Milligan school. The board first addressed a request from Paul Jensen for a zoning change. The county zoning board recommended the change from industrial to commercial for the property Jensen recently purchased on East Boundary. The board approved the zoning change. Steve Parr from JEO reviewed a packet of possible road and infrastructure projects with the board including paving several blocks, redoing the paving on several blocks and new light fixtures downtown. The board also looked at a project to replace the aging water main lines downtown. 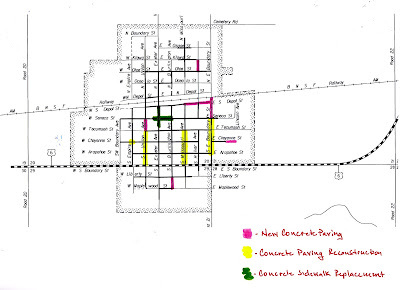 When discussing the street paving projects, the board noted several options for continuing a street project. 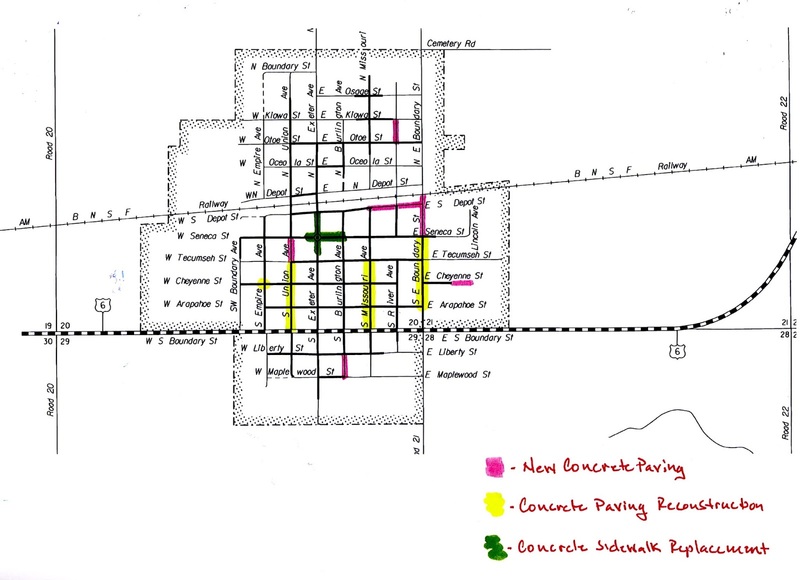 If 60 percent of the adjacent property owners are for the project then a street improvement district can be formed and the paving can be done. Also, the village has the option to pave any unpaved street off of a paved intersection. The estimated cost for the sidewalk, lighting and water main project downtown are around $650,000. The village would secure bonds to pay for the project and these bonds would replace other street repair bonds that will be paid off in 2019. There would be no additional cost to taxpayers as the village would just pay the interest on the new bond until 2019 and then begin to pay principal. The board reviewed the one and six year plan and asked Steve to revise the plan according to the discussion. The one and six year plans along with the full estimates for the proposed concrete projects are available in the village office. The board moved on to some maintenance issues including a problem with termites at the Senior Center. The board noted that the agreement with the senior center includes the village taking care of the upkeep and pest control at the senior center. Exeter Village Clerk pointed out the most recent fiscal year review and the expense report which shows the village had very less than $600 overage. Maintenance Supervisor John Mueller started his report with the options for the mold abatement post inspections at the village office. The board opted to pay for all of the air quality tests. Mueller presented the board with some tractor brochures and the board decided to review them and table a decision until the next meeting. Mueller also reported that the soft start switches at the lift station were going bad and it will cost $1600 to replace them. Mueller and Board Member Justin Harre updated the board on the ballfield progress. The sprinklers were projected to be done at the end of the week. The new surface was slated for the next week. Michl and Wilbeck thought it had been more than 30 years since anything had been done to the ballfield. Michl noted that there are grants available and some would take into account the investment the village made removing the tag factory. Clerk Becky Erdkamp noted that sales tax for August was $10,673.43 and Keno for September was $257.74. She reminded the board that the audit would be December 7. The board set the next meeting for December 7 at 7 p.m.